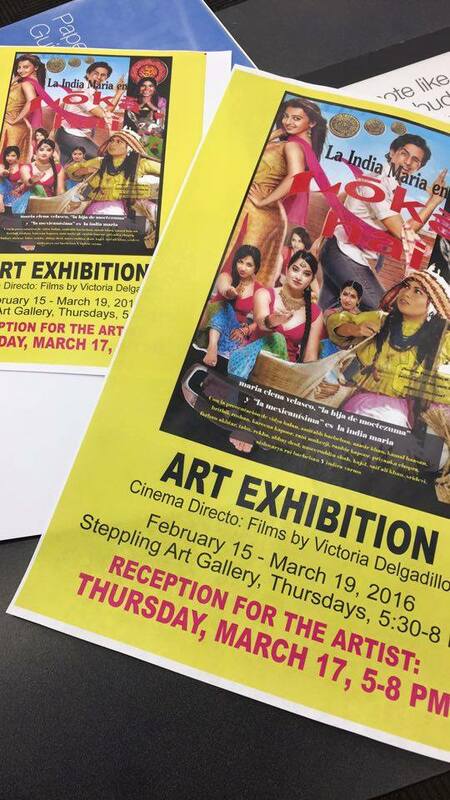 took place at Steppling Art Gallery, San Diego State University Imperial Valley Campus, 720 Heber Avenue, Calexico, CA 92231 (760) 768-5536. It was curated by: Luis G.Hernandez. On Thursday, March 17, 2016, I traveled to Calexico for a student lecture, Title: “Separate Reality: A Journey through Chicana/o Art” in Room N-101 at noon and an Artist reception in the gallery from 5pm to 8pm. Both events were well attended and I received some very engaging questions by the students (a majority being young women). On Friday, March 18, 2016 I was interviewed about Cinema Directo at Radio Formula 1150 in Mexicali, Baja California. Each Friday afternoon in the 3pm to 4pm spot Rubén Gómez (twitter.com/ruhgr) features art in the Imperial Valley. I struggled through the 15 minute moment in Spanish–but it was fun! “LA Woman”, a selected entry for “Out of the Window,” the first and highly revered Transit TV Film Festival on the Los Angeles Metro. Through the solitude of driving across Los Angeles, there can be a spirituality of visual offerings, some spontaneous and others purposeful. Influenced by Film Director Jean-Luc Godard of the French New Wave movement (i.e., no script or storyboard, and letting the narrative evolve on set), I wanted to communicate the experience of a heavy car culture ride in Los Angeles. In “LA Woman,” the film’s subjects, women on billboards, are invoked to tell their own interconnected story. “Ms 40oz”, a documentation of a larger exhibition on the gentrification of businesses in downtown Los Angeles, was a performance that I scripted and directed. Drawing from archetypes of gang violence in the media and feelings of agitation by the sudden media approval of singer Gwen Stefani dressed as a Chola, “Ms 40oz” was a self-determined humorous street intervention. In the style of “ribbon-cutting,” which was comprised of mariachis and mural unveilings when my family opened a new business, “Ms. 40oz” celebrates the festivity of a street blessing for prosperity without forgetting those who came before. Ms 40oz is portrayed by Jennifer Salinas, a former Miss Illinois and also a Miss America contestant. “báwrdər”, a joy ride in Tijuana to the beach with swept-away-by-a-wave music by Baja Californian Ceci Bastida. “báwrdər,” the phonetic pronunciation of the word border, features separated families, lovers and children sitting on both sides of the US/Mexico border sharing food, documents and letters through a chain-linked fence. On the Tijuana side, there are restaurants with beachside panoramic views that are disturbed by the sudden lunge of a speeding immigration van pushing someone back for getting too close to US land. When this happens, diners in the restaurants jump up from their meals and everyone gasps. In Calexico I learned that the footage I filmed is no longer how that section of the border looks. “Bridge Love”, a film about The 6th Street Bridge Viaduct in East Los Angeles, a city monument that has appeared in numerous films, television shows, music videos and video games since 1932. “Bridge Love” was shot in Super 8 film and contains the elements of timelessness that I aspire to obtain in most of my work. The sense of timelessness is achieved through a studied selection of clothing, props, sets, make-up, color choices, and though the refusal to use the latest popular film embellishments. “Santa Perversa in Cuba” was filmed on location in 2008. This film is a poetry video of Los Angeles performance artist Reina Alejandra Ibarra as she is offering her message of ardent love. A bootleg cd of Juan Formell y los Van Van that I purchased in a covert transaction on a Havana street flavors the video with an authenticity of the moment. Shot during a time when Americans traveling to Cuba could be prosecuted severely by the US government, “Santa Perversa in Cuba” is an entertaining time stamp of a moment in history. Cinema Directo will featured “what if” code switching movie posters that I created such as “What if La India Maria starred in a Bollywood film?” These movie posters were inspired by my favorite film genres and themes, my artistic collaborators and by the following movie titles by Mexican Director Ícaro Cisneros: Las Sobrinas del Diablo (1982), El Triángulo del Crimen (1983), Gente Violenta (1977), Las Cabareteras (1980), Vividores de Mujeres (1981), Las Fabulosas del Reventón (1982), Disputas en la Calle (1979), La Golfa del Barrio (1981), and Esos Viejos Raboverdes (1982).